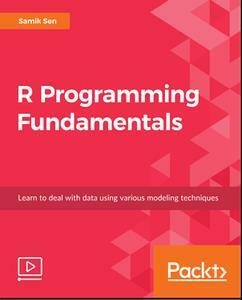 R Programming Fundamentals, focused on R and the R ecosystem, introduces you to the tools for working with data. To start with, you'll understand you how to set up R and RStudio, followed by exploring R packages, functions, data structures, control flow, and loops. Once you have grasped the basics, you'll move on to studying data visualization and graphics. You'll learn how to build statistical and advanced plots using the powerful ggplot2 library. In addition to this, you'll discover data management concepts such as factoring, pivoting, aggregating, merging, and dealing with missing values. By the end of this course, you'll have completed an entire data science project of your own for your portfolio or blog.